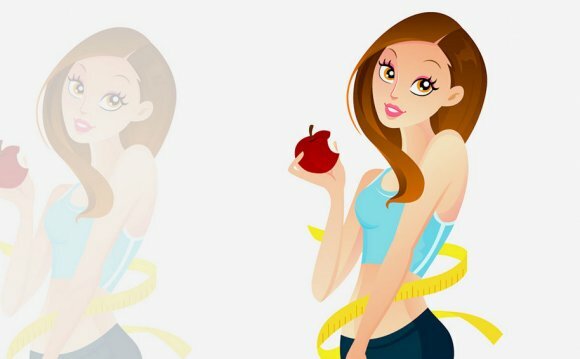 If you want quick results, you'll probably need to change your eating habits to reflect a healthier diet. However, this does not mean that you should starve yourself. Starving yourself causes your metabolism—the process by which your body burns fat—to slow down dramatically so that it can store up energy. You won't lose weight, and you might even gain it. It is important to remember that your body is changing as a result of hormone fluctuations. It is natural to experience some weight fluctuation as well. It is best to follow a consistent, healthy diet every day to ensure that your body can ride the hormonal wave. Do not develop an eating disorder. Anorexia and bulimia are serious conditions that need treatment. If you think you might have an eating disorder, tell someone you trust and seek help immediately. No amount of weight loss is worth jeopardizing your health. A glass of water at meals. This is a healthier choice than sugary soft drinks and artificial juice. Try adding a few slices of lemon to your water. It will get rid of the toxins in your body. Drink as much water as you can, as often as you can. Minimum 3 servings of fruit daily. Eat simple carbohydrates (refined and processed products including muffins, cakes, cereals, white bread, white pasta) sparingly. Eating carbohydrates from artificial sugars and refined carbs will leave you bloated. Choose complex carbohydrates such as whole grains, sweet potatoes, yams, whole rice, quinoa, and couscous instead. Make menus for yourself. Know what foods you need not to eat and make healthy menus for yourself. Here are some suggestions on what you should eat. Toast with your favorite spread. Bananas are high in potassium. Try cereal with skimmed milk and fruit. It's best to bring your lunch from home. School food can be unhealthy, and you probably don't have much choice over what there is to eat. Try a sandwich on wholegrain/whole wheat/multi-grain bread with lean chicken, ham, or a butter-fried egg (using butter to fry egg instead of oil). Don't use white bread – it's made from bleached flour, and it contains very few nutrients. Add a salad with veggies (tomato, cucumber, lettuce, etc); a glass of milk; and veggie snacks like carrot sticks and celery. Snack Ideas: veggies and fruit; natural yogurt and berries; a handful of nuts; veggies (like carrots, beans, snow peas) and low-fat dip. Do not buy yogurt-coated or chocolate-coated raisins or nuts. Most of these are full of added sugar. One idea is: 1/2 veggies, 1/4 protein, 1/4 carbohydrates. If your parents make fatty foods for dinner, only have a little, then make yourself a salad on the side. If you're cooking for yourself: make brown rice (eating more lean meat than part carbohydrates helps); scrambled eggs; make yourself a sandwich; or eat some fish (it's high in omega-3, which is good for your brain). Follow the basic rules of healthy eating. Eat three meals a day and two snacks in between. For each meal, make the veggies the largest portion, then the protein, then the carbohydrates. Feel free to include dairy with any meal. Try to refrain from drinking anything but water and unsweetened tea. Water is the best liquid for keeping you hydrated; it helps your body burn fat; and it may even help keep your skin clear and zit-free! As an added bonus: drinking only water means that you won't drink any sugar-water or energy drinks, which can contain up to 800 calories per drink. Just think: almost half your daily calories in one drink! Water is healthy, it tastes good, and it's an essential part of keeping you trim. If you find yourself consistently hungry after every meal: try drinking a big glass of water or green tea (unsweetened) before you eat. It'll help fill you up, and it doesn't contain any extra calories. To burn more calories, drink ice-cold water. Your body will spend more energy warming it up. A glass of cold water also feels refreshing after lots of exercise. Eat everything in moderation. Consider toning down your consumption, but not cutting anything out completely. Eat things like red meats once a week or once a month – you'll enjoy them more anyway! As exceptions: try to cut out fast food, sweets (chocolate, candy, chips, soda, etc. ), and other junk food (soft drinks, burgers, ice cream, etc.) Avoid the strategy of allowing yourself one "cheat day" per week, as this can lead to one day of binging. Try setting one day each week when you can have a small treat after dinner. If this is too difficult for you, then start with a small treat after dinner every day, and slowly switch to one day. Although you can have it at any time of the day, it's better to have it after dinner because you can look forward to it all day. Fast food and sweets are highly processed, fatty, and unhealthy. McDonald's soft serves are made from pig fat, KFC fries are fried in lard, and thick-shakes contain almost no natural ingredients! It's all preservatives and additives. Know what is good for you and what isn't.